Washing machines can be confusing so it can be useful to get clued up on how to use a washing machine. From temperatures to loads, cycles and settings, we’ll tell you what’s what. Which temperature should I use when washing my clothes? A warm wash, at around 40°C is perfect for most items and does not risk shrinking or damaging clothes too easily. This could be considered your everyday setting. We recommend that you use cold or cool wash programmes (30-40°C) for darker colours that may ‘bleed’ colour, and cool to warm settings (40-50°C) for items made from fabric that could be prone to shrinking. Note that you will need to use slightly more detergent with a cool wash as it will not be able to foam up as well. The 60-90°C hot wash should be reserved for when you want to remove germs and heavy dirt from clothes, towels and bedding. Be aware that hot wash settings could potentially shrink garments. Your dirty clothing is placed into the drum, you add detergent and select the programme you want. So what happens inside a washing machine next? Water then fills the drum and takes the detergent with it. The thermostat tests the temperature and adjusts it if necessary, then the drum will rotate. The dirt is trapped and drained ready for clean water to flow through. Once the clothes are rinsed the drum will start spinning faster thanks to the programmer telling it to do so. The clothes are almost dry and a pump magically drains any leftover water, job done! Most washing machines have full and half load settings to make sure your clothes are thoroughly cleaned no matter the load size. Half load settings are more economical if you have a small load as they use less power and water. 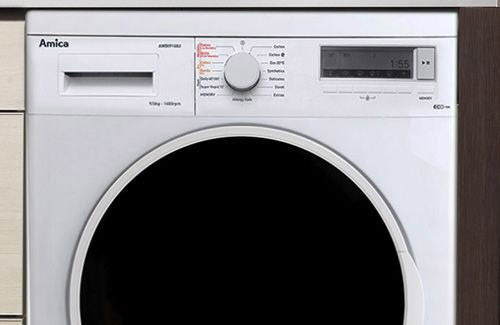 To ensure your washer runs properly you shouldn’t over-fill it. If the washing machine load is too heavy you could damage your washer. So what happens if you overload your washer? You could do damage to the drum which will affect the efficiency of the washer. Your clothes probably won’t come out clean either. Filling up to over the capacity won’t allow enough room for the water and detergent to move around properly. This will leave you with clothes that could need another wash. Keep loads within the capacity of your washing machine, it will save you time, effort and money in the long run! Normal: this is a 30 or 40°C wash that’s suitable for coloured mixed fabrics. Clothes are washed at a warm temperature and rinsed in cold water. The spin is moderate. Delicates: this cycle uses cool water (30°C) and slow spin speed to protect fabrics that could get damaged in a more vigorous wash. Lace, wool and silk items may be suitable for this type of wash, but always check the label for specific washing instructions. Whites: usually a 60 or 90°C wash with a fast spin. This vigorous and hot wash cycle is designed to get all the dirt possible out to leave your whites looking really clean. Rinse: clothes that don’t need a full wash can be given a rinse with this quick cycle. Spin: spin cycles can be used to get excess water out of fabrics. They don’t wash the clothes, but can save you hanging dripping wet items up to dry. 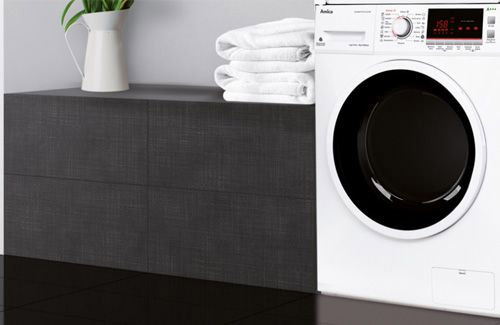 The AWT14S integrated washing machine has over 16 features, including a wool wash and intensive wash function, so you’re spoilt for choice. 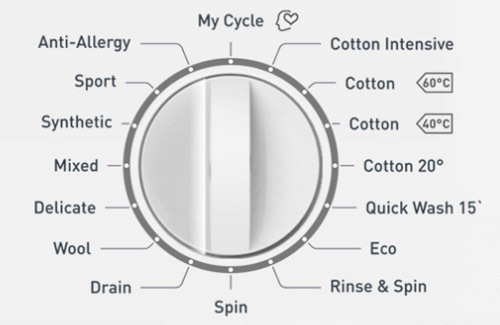 If you’re wondering how to choose washing machine settings, take a look at our detailed guide to washing different types of fabric below. 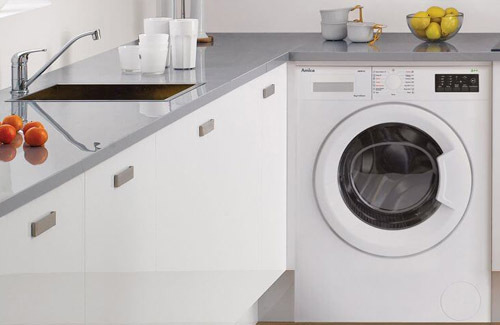 Certain washing machine settings are better for different materials. Here’s a guide to some of the settings best for your favourite fabrics. Use a delicates cycle for jeans at a low temperature (30°C). This will prevent jeans from shrinking. Try not to wash jeans too often as they quickly fade. When you do wash them, turn them inside out to protect the dye. Bed linens can usually withstand higher temperatures, unless the labels states differently, which is great as they need to be washed at higher temperatures to remove bacteria and skin cells because we sleep in them. Polyester blends will need to be washed at a lower temperature than cottons. Avoid mixing dark and light colours. Hang bed sheets in sunlight to dry where possible. Sunlight is a natural disinfectant and will bleach whites further. Coats should be washed on a delicates cycle at a low temperature (30°C). Pillows and duvets may need a warmer wash. Some washers have a bulky items setting ideal for coats, pillows and duvets. An occasional wash can help to prolong the life of coats and duvets, while a regular wash of pillows is vital to help remove skin cells and any dust mites. 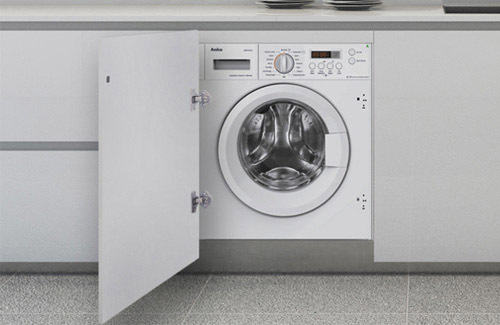 Be aware of the wash load of your machine as it can be easy to overfill when washing bulky items. Use a warm, not hot, wash on these items and check the washing label for coats if they contain wool to avoid shrinking. If suitable, tumble dry on a low setting as bulky items can be heavy and difficult to dry on a washing line. Use a delicate was cycle (30°). Many silks are now washable in your machine, without having to take them to the dry cleaners. Always check the label for washing instructions. Be aware of colour bleeding in your washing machine and wash with similar colours only. You may need to dry clean silks with noticeable stains as spot cleaners will mark the garment. A light soak in a sink with mild laundry detergent before running a delicate wash could get rid of stains on the silk. Avoid tumble drying and lie flat to dry. Do not wring out the water and always use the hand wash or delicates setting. Wash as normal on a 40°C cycle. PE kits should be washed at a higher temperature than the rest of the uniform to get rid of bacteria and set in stains like grass. Trousers, skirts and blazers can be washed together on a warm wash setting; unless the blazer is wool then wash this with the woollen jumpers. Use a wool setting for sweaters and woollen blazers. White shirts and polo shirts can be washed with similar colours on a setting recommended by the laundry label. Wash on a delicates cycle at 30°C. Clothes with elastane and lycra must not be washed on too hot a setting. Please also check the label to assess if they are suitable for drying in a tumble dryer. Using tumble dryer sheets can prevent this type of fabric from becoming static in the dryer. Use a 60-90°C wash cycle. Cotton is the best fabric for withstanding high temperatures. Wash with similar colours. Most linen items can be washed on a normal cycle at 40°C. Linen can be washed cold or hot but is susceptible to colour bleeding so only wash with similar colours. Wash darker colours on a cool wash (30°C) to minimise colour bleed. Linen can crease easily in the wash. Use a fabric softener to limit this during the wash cycle and select the anti-crease setting on your washing machine or dryer to prevent creases from setting. Avoid over drying as this can make linens ‘crispy’. Finish the dryer cycle slightly early and hang up linens to finish drying. Use the hand wash, delicates or wool setting on your washing machine and select a low temperature (30°C). Select a lower spin speed to prevent stretching and damage to the woollen garment. Do not tumble dry as this will shrink the wool. Will washing machines remove blood? Soak the item for 30 minutes in white vinegar before washing. Alternatively, use hydrogen peroxide to remove the stain. Please note that this may bleach the fabrics. Lemon and table salt sprinkled onto the stain can lighten it. Please note that this may bleach the fabrics. A paste made from bicarbonate of soda and water applied to the stain can be effective in removing it. Can washing machines rip clothes? The only way that a washing machine could rip or damage clothing is if the drum itself was damaged and had somehow developed a sharp or rough edge. Alternatively, check to see if other items in the laundry load have zips or eyelets with sharp edges that could have damaged the garment. An escapee bra underwire is a common culprit for washing machine damage! Will a washing machine remove cat hair? Washing machines will not naturally remove cat hair. A quick turn in the tumble dryer, with little or no heat, will get rid of pet hairs easily. The trapped hair can easily be cleaned away from the lint filter after the cycle has finished. Will washing machines kill fleas, bed bugs, ticks, lice & spiders? Using a hot temperature wash will kill any nasties that you have found on washable items in the home. Adult cat fleas die at temperatures lower than 8°C or higher than 35°C. A temperature of 50°C is required for lice while bed bugs will not be destroyed unless the wash temperature is above 60°C for around 20 minutes. If you have an infestation, wash items in as high a temperature as the material will allow to ensure that you get rid of any resistant specimens. Remember to treat your home as well, so that they don’t return. On the subject of spiders, why would you want to kill them in your home? They will take care of pesky flies in the summer and are far more afraid of you than you are of them. Save the spiders! Will my washing machine kill mould? Water and washing alone will not kill mould. Adding a cup or two of white vinegar to the wash will effectively kill and remove mould and mildew. It is also worth noting that leaving your washing machine door ajar between washes will allow dry air to circulate into the damp drum, preventing mould from forming in the drum and around the seal of your appliance.